Summary: According to researchers, for the aging brain, distractions and reduced focus may not be as bad as we think. This figure shows the relationship between task performance and level of cognitive control. NeuroscienceNews.com image is credited to Amer, Campbell, Hasher/Trends in Cognitive Sciences 2016. Funding: This work is supported by the Natural Sciences and Engineering Research Council of Canada through the Department of Psychology at the University of Toronto, the Rotman Research Institute, and the Department of Psychology at Harvard University. Image Source: This NeuroscienceNews.com image is credited to Amer, Campbell, Hasher/Trends in Cognitive Sciences 2016. Cell Press. “The Aging Brain Benefits From Distraction.” NeuroscienceNews. NeuroscienceNews, 15 November 2016. Cell Press. “The Aging Brain Benefits From Distraction.” http://neurosciencenews.com/distraction-brain-aging-5515/ (accessed November 15, 2016). Cognitive control, the ability to limit attention to goal-relevant information, aids performance on a wide range of laboratory tasks. However, there are many day-to-day functions which require little to no control and others which even benefit from reduced control. We review behavioral and neuroimaging evidence demonstrating that reduced control can enhance the performance of both older and, under some circumstances, younger adults. Using healthy aging as a model, we demonstrate that decreased cognitive control benefits performance on tasks ranging from acquiring and using environmental information to generating creative solutions to problems. Cognitive control is thus a double-edged sword – aiding performance on some tasks when fully engaged, and many others when less engaged. 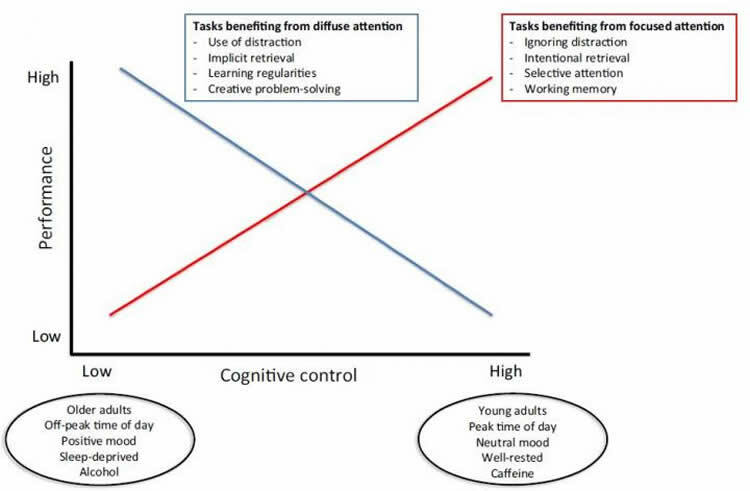 The ability to selectively focus attention and inhibit distraction (i.e., cognitive control) contributes to a broad set of cognitive functions aiding performance on explicit, goal-driven tasks. Recent developments have shown that a broader focus of attention, afforded by reduced control, is more beneficial in some learning, memory, and problem-solving contexts which depend on extracting and utilizing information from a variety of sources. In older adults, reduced control appears to provide advantages on some tasks, such as using previously acquired environmental information, learning regularities, and creative problem solving. This processing style allows older and, under some circumstances, younger adults to handle many challenges encountered in everyday life, and possibly contributes to the high functioning of many older adults outside the lab.